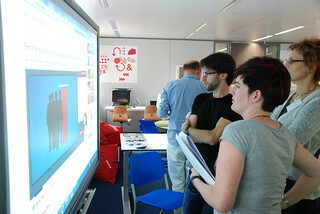 The 1st Science projects workshop in the FCL was organized in the framework of the first Scientix and took place during the weekend of the 14-16 of September 2012. 50 people including teachers and science education practitioners (partners in EC funded projects) participated in the workshop. During over 15 hours science teachers working on different EC funded projects took forward their programmes of work and discussed and experimented on making STEM teaching more motivating and engaging in the future classroom. The training used the content and best practices of different EC projects which can be accessed through the Scientix portal and the setting and facilities of EUN’s Future Classroom Lab. All participants had the opportunity to learn about different science projects such as Xplore Health, Global Excursion, Pathway, inGenious and UniSchooLabs, as well as of course Scientix and the Future Classroom Lab.